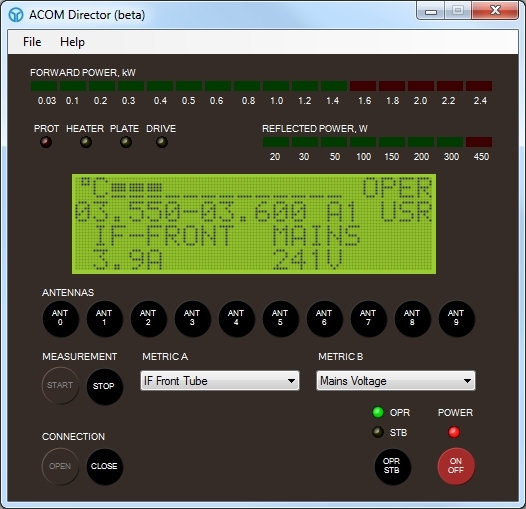 Following the initial release of the ACOM Director beta the feedback has been excellent and it appears to have been very well received by the ACOM 2000 user community. Thank you to everyone who downloaded a copy and tried it out, your bug reports, comments and opinions are invaluable in moving the software forward. I am now working on the next beta release which i hope to make available soon and will be putting up a dedicated page on my site for ACOM Director, this will contain information on what type of cable is needed to connect to the ACOM 2000 and information on what type of interface is needed to support the remote power on features. Thanks again to everyone who has tried out the software.